As winters approach, mufflers and scarves are the fashion trend of the hour. It can be a simple shield against Mother Nature’s extremes, or a fashion accessory for the style conscious. The necessity in the harsh conditions in the west paves way of a fashion trend worth following in the chilly evenings of the east. Scarves come in all colors and styles to fit the latest in fashion styles. The scarves can be from rich thick woven styles to silky and designer label ridden flashes. Scarves can be easily adorned over all types of dresses to flaunt as a fashion accessory. Scarves have recently caught the imagination of famous labels like Gucci, Louis Vutton and Dolce & Gabana and for the extremely style conscious, it can be a way to show off these brands. Often during the winters, the holiday season brings out the tuxedoes and dinner jackets, scarves are perfect compliments to such dress ups. The latest casual fashion trends focus on thick and chunky hand woven wool scarves which crowd the neck area of the wearers. This performs the dual role of a fashion style accessory and a warmer. 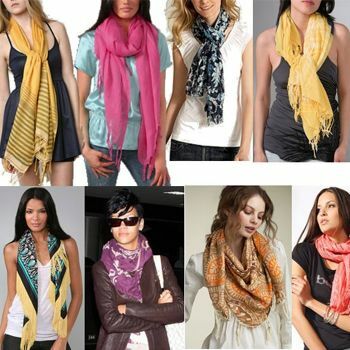 The styles with which the scarves are many and follow style trends. The scarves can be wrapped around the neck, tied in a knot or just left hanging loose according to the need of the wearer. The right style and the right type of scarf, if rightly worn can make the standing out difference in an outfit. The importance of scarves as a fashion accessory and a valid dressing option is vast. These winters, search the local clothing stores for a variety of patterns a styles and make a few scarves the central focus of your wardrobe. There colors a many to compliment and adorn your dresses and ensure that you are praised to be stylistic and fashion conscious. So this winter, get ready and stock up on a repertoire of scarves and mufflers to keep within the trends. Be sure to mix and match to impress your friends and acquaintances and make a bold fashion statement to the masses.